1. Place the beef, breadcrumbs, carrot and cornichons in a large bowl, and mix together well. Stir in the egg, then firmly shape into 6 even-sized burgers. Chill until ready to cook. 2. Meanwhile, mix together the tomatoes, avocado, red onion, lime zest and juice, and the mint. Chill until ready to serve. 3. Cook the burgers on a barbecue or under a preheated grill for 5-6 minutes on each side until nicely browned and cooked through. 4. Cut the loaf in half lengthways, then cut each half into 3 even pieces. Toast the cut sides of the bread under the grill until golden. 5. Lay 2-3 lettuce leaves on each piece of ciabatta, then top with a burger. Spoon over the avocado salsa and serve straight away. 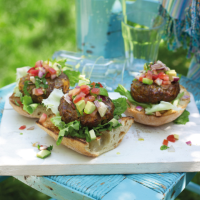 For fashionable ‘sliders’, shape the beef mixture into 12 mini burgers and serve in Waitrose assorted mini rolls. Or for delicious spicy pork burgers, swap the beef for lean minced free range pork and add 1 tsp of a spice blend such as Bart Ras el Hanout or Jerk Spice.